The Bulls are getting the band back together. At least with a few new members. The Bulls Sunday agreed to terms on a two-year deal with veteran point guard Kirk Hinrich. Former first round draft pick Nikola Mirotic also posted on his Twitter account–as Pau Gasol did Saturday–that he was signing with the Bulls. Mirotic’s deal is estimated at three years and about $17 million starting around $5.3 million. “I am very happy and excited to announce that next season I will be playing with the Chicago Bulls. Today I fulfill a dream,” Mirotic wrote. “I am very happy and excited to announce that next season I will be playing with the Chicago Bulls. Today I fulfill a dream,” Mirotic wrote on Twitter. The moves don’t necessarily put an end to the Bulls potential deals for this summer as the team is believed to remain in pursuit of a shooting guard. With the deals for Hinrich under the so-called $2.7 million annual “room exception,” Mirotic and Gasol, the latter estimated at about $18 million to $20 million for three years, the Bulls have exhausted the salary cap space they would have after an amnesty for Carlos Boozer. That would have to be done this week. But a trade remains possible. The Bulls also remain on the lookout for a shooting guard in a possible trade and had not given up hope they could persuade D.J. Augustin to return for a limited financial contract and perhaps see him parlay that into a better deal in the future. But reports from Yahoo Sports late Sunday were Augustin would accept a two-year offer from the Detroit Pistons. So the Bulls roster, even without the hoped for additions of All-Star players like Carmelo Anthony or Kevin Love, looks like it should be in the middle of serious postseason contention in the Eastern Conference. I personally believe rookie Doug McDermott is good enough to become a starter and give Dunleavy minutes off the bench, which should be his best role as a shooter. McDermott in his first summer league play in Las Vegas this week has shown an expected ability to shoot, but more the capacity to defend and make plays with the ball. Bulls coach Tom Thibodeau, like most NBA coaches with veteran teams in contention, generally is not a fan of major early roles for rookies. But McDermott has the ability to work into that position. In other news around the NBA Sunday, former Bull Luol Deng agreed to a two-year contract for about $20 million with the Miami Heat. It was a fallback situation for Deng, who seemingly overplayed his hand after turning down a three-year $30 million offer from the Bulls when they traded him to the Cavaliers last January. Deng negotiated a second year player option. So he likely will become a free agent next summer. He’d hoped to get a deal close to the $14 million for Andre Iguodala last summer. But that wasn’t there and Deng “settled” for the Miami offer. It’s still quite a bit of money, if less than what the Bulls offered in security. The situation was a classic lack of communication and Deng elected to take his chances despite his love for playing in Chicago. Going to Miami doesn’t appear a great situation for Deng as he’ll have to follow LeBron James and play with a backcourt of Mario Chalmers and Dwyane Wade, neither much practiced in passing the ball for a cutter like Deng. Though the winters are much milder. Perhaps Deng would have remained a better fit for the Bulls given his perimeter role as the Bulls are now stacked inside with Noah, Gasol, Taj Gibson and Mirotic. Questions will arise about playing time, starting, finishing the games and rotations. But having front line depth should be a big playoff advantage for the Bulls. And not only for the rebounding, defense and inside scoring potential with a big time center support for Noah with Gasol. The Gasol signing was a coup for the Bulls with several teams competing for him. Gasol told friends he went to the Bulls because he believed that was his best chance to win, even rejecting offers as much as eight figures compared to perhaps the approximately $7 million annual deal he could get from the Bulls. 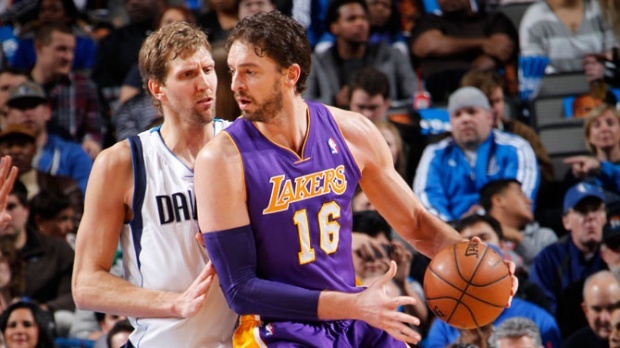 The terms still aren’t final and getting Gasol seems a major upgrade on the front line. Hinrich also accepted less to remain with the Bulls as he reportedly had an $8 million offer for two years, believed to be from the Jazz or Hawks. Thibodeau, meanwhile, should be able to better rest inside players now with four players competing for perhaps 96 minutes. It’s possible three could play together at times with Mirotic an outside shooter and Gibson able to defend on the perimeter depending on matchups. But the benefit should be to have a more rested Noah and Gasol come playoff time. Though it seemed likely Gibson would move into a starting role with the likely departure of Boozer, it’s probably best for now he remain a sixth man. That’s because at 34 years old, it would be more difficult for Gasol to warm up before the game and then sit through the pregame activities and start until the first timeout halfway through the first quarter. Thibodeau had been removing Noah early in the first quarter at times. But it’s more difficult for an older player like Gasol to first come into a game at that point. The close of games will be decided as Thibodeau and the best coaches always do: Whomever is playing the best continues. It’s maybe not quite yet a set bench mob. Though Hinrich isn’t as good a shooter as Augustin, Hinrich is a better overall fit as he can move to point guard and have Rose play off the ball and have Hinrich defend the shooting guard. The Bulls would less be able to play Rose off the ball with Augustin, though Hinrich and Augustin played well together last season. Also, Hinrich was among the team’s leaders in plus/minus and a favorite with Thibodeau for that reason. The biggest gap for now remains at shooting guard. The Bulls shooting should be much improved with the return of Rose and the additions of McDermott and Mirotic, though depending on how much the two rookies are able to play. Now without the addition of Augustin, it’s also possible summer league free agent Billy Baron could be a possible addition given his ability to shoot and handle the ball. Jimmy Butler likely retains the starting shooting guard position. He is eligible for a contract extension before the season begins. Though given the financial commitments it’s perhaps more feasible to allow him to become a restricted free agent and then be in position to match a contract offer after next season. One favorable possibility is the emergence of Tony Snell as a shooting guard option. The second year swingman has shot the ball impressively from three-point range in the team’s two summer league games. Snell is listed technically as a small forward, though the wing positions can be interchangeable. So Snell could backup both Butler and Dunleavy with McDermott showing enough in summer league as well to make the case as a legitimate small forward backup. The Bulls also are believed to be searching out trades for a shooting guard. Snell and McDermott worked well together for the summer league team with Snell showing an ability to make plays with the ball and find shooting opportunities for McDermott. When the Clippers in the first game were doubling McDermott, he also found openings for Snell. Though defense could be an issue with McDermott and Snell together, playing with Hinrich and Gibson would provide a defensive component. Thibodeau also would have ample mix and match opportunities with the four big men up front. Plus, Randolph has athletic talent and could fill in if he remains into the season. It’s not the big two and big three star model. But the Spurs and Mavericks have won two of the last four titles with a formula based on depth, size and versatile team play. There are many different ways to succeed and the Bulls appear much improved. They’re men on a mission.